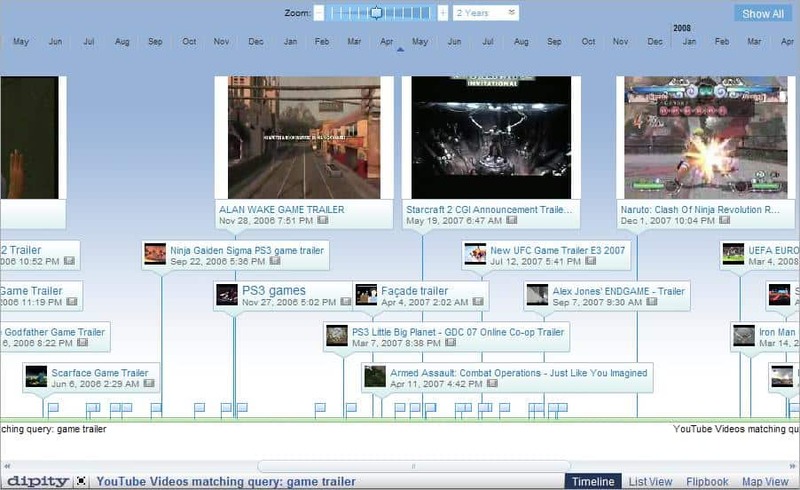 Timetube is a Youtube mashup that creates a timeline of Youtube videos related to a keyword that the user is searching for. The time period can be altered from 1 day to 100 years which tells me that the developers have plans to offer this service for a very, very long time. While sorting the results by time is not something special, even the default search at Youtube can do that, the display of the results makes it special. Results are sorted on a timeline and weighted by popularity. The most popular videos are displayed with big preview images, the lesser popular ones with smaller thumbnails and then there are the results without thumbnail. The title of the video and the day of it's posting are always displayed as well so that it's possible to understand what a video will be about even if no thumbnail is shown. A click on a video loads that video on the same page with virtually no delay offering the usual Youtube controls. Timetube offers an excellent possibility to visualize Youtube search results, excellent idea and interface.